GaelSong Exclusive! John Barleycorn, the convivial embodiment of beer and whiskey, is another aspect of the Green Man. Offer him a bottle, and he'll happily remove the top for you! 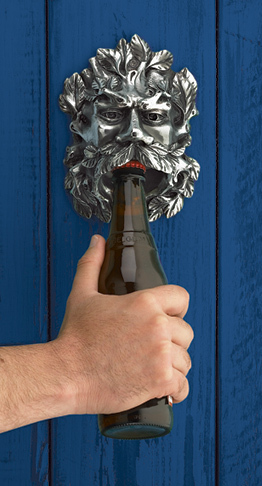 Wall-mounted Green Man bottle opener brings a festive air to any kitchen, bar or game room. 6 1/4" high, heavyweight pewter-finish resin. Mounting hardware included. Fast delivery during busy Christmas season; gift was very well liked. Both my son-in-laws loved the bottle opener-perfect for their pool table room and rec room! I was very happy with my order. Thank you for getting it shipped to me so fast. This was our son's Christmas gift for his "speak easy" bar/room. He loved it! Great gift! Well made. Great face. Christmas gift. I got the forest colored John Barleycorn opener and it is very nice against the new brown siding on the wall by the back door where our deck is. The colors are much better than I imagined and well done on mine. So many compliments so far and strong hints for future gift occasions. Weatherproofing for outdoors sounds like a great idea but I will just take it inside for the winter this year. I purchased this as a gift which was well received. The John Barleycorn Opener is well made, it is made of resin but appears metallic. Hardware is included.